Rather than watch the final round of the 2008 Masters, Jack Nicklaus flew unannounced to Tucson and made a few final design tweaks at the Ritz-Carlton Golf Club. He did two things on that warm April day: He put his signature on the new home of the WGC- Accenture Match Play Championship and he didn’t compromise. Wow? As if to match Nicklaus’ vast design, the Ritz-Carlton Golf Club has an 8,000- square-foot putting green and a 50,000 square-foot clubhouse with 17 fireplaces. It didn’t intend to be one of the guys. It intended to be glamorous, and it is. Better news: It has been completed on schedule. Construction of fan accommodations for the Feb. 23-March 1 championship begins next month. Nicklaus’ 27-hole design was constructed with a duality: to serve what the Ritz-Carlton people hope will eventually be a 450-member club and to be a spectator-friendly PGA Tour event. From the back tees, about 7,900 yards, there is a third purpose: to require the world’s 64 leading golfers to break a sweat. The Ritz-Carlton has been playable for almost a month. It won’t officially open until early January, and Nicklaus’ dedication of the course probably won’t be held until early spring. But the PGA Tour and officials of the Match Play event are prepared to launch an on-site building project to accommodate about 15,000 fans per day during the championship. You’ll like this: There is considerably more on-site parking space than at the Gallery Golf Club’s South Course, which played host to the tournament in 2007 and 2008. One thing spectators won’t see is Nicklaus’ signature nine holes, the Wild Burro course. PGA Tour officials determined that it didn’t handle the flow of foot-traffic well enough for the championship. Thus, the Match Play event will utilize the Saguaro nine and the Tortolita nine, two courses that loop to and from the sprawling clubhouse. In Tucson’s 62-year run as a host-site on the PGA Tour, every conceivable type of course has been utilized. 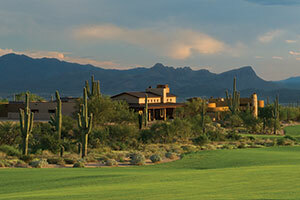 El Rio, the lowbrow property of Tucson City Golf’s five muni courses, was the initial host. It is flat, short and tree-infested. To be polite, it is not in an upscale neighborhood. Doesn’t even have a swimming pool. Forty Niner Country Club, a Midwest-style course, had a brief run in the early 1960s, but it was judged too remote to make sense. Its location near the Rincon Mountain foothills is now much more centrally located than either the Gallery or Ritz-Carlton. And now it is but, alas, Nicklaus, 68, is retired from tournament golf. He has given us a 21st century course for a 21st century event. Depew, a former nuclear power engineer who grew up in Michigan and has spent the last eight years as the Ritz-Carlton’s top golf guy at the White Witch Golf Course in Jamaica, is among the 600 daily employees hustling to get the 850-acre project functional before late February. He chuckles at the length of the course and marvels at the natural beauty of the Wild Burro Wash and surrounding areas.